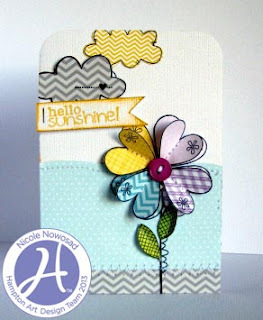 Cute cards and great colors! Such gorgeous cards and so bright and cheerful. Crazy cute cards ladies! Love them! Love these cards! The cluster of flowers is just right on the first one and I love the dimensional flower on the second! Making flower petals with hearts is very cute. Love these flowers! Love the papers you chose to use. Very colorful and happy! Such cute cards! They are so adorable and anyone would love to receive them! TFS! I love how Nicole Nowosad had created a flower with the hearts, and the depth and dimension she has given it. Beautiful. Love the stamped and popped flowers for the bouquet on the card by Leanne. Both cards are amazing. Wow.. These are really pretty. I love the pattern paper and the fun colors of the flowers. Beautiful. Very cute--I like the paper pieced flowers. Cute, thanks for the chance to win! Cute card! I like how you stamped on the patterned paper. I always forget about doing that! The flowers are so bright and cheerful. they make you smile. thanks for sharing. I love these !! I love all flowers ....so yea ...these are awesome !! TFS. Wow! Such happy cards - love the flowers!